I recently updated my HWINFO and now my plugins aren't reading any of the data. 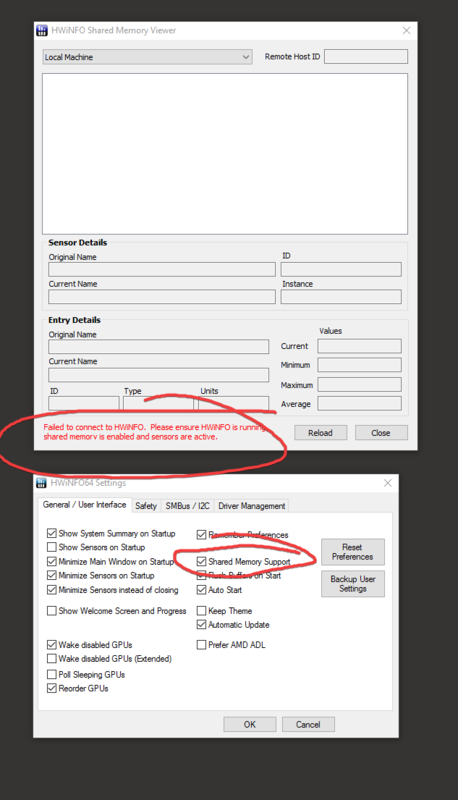 I've gone into the settings and selected "enable shared memory viewer", and I've tried running hwinfo as administrator, but i can't find the HWiNFOSharedMemoryViewer.exe anywhere and the one that i did have says "Failed to connect to HWINFO. Please ensure HWINFO is running, shared memory is enabled and sensors are active." Is the sensors screen of HWiNFO active (opened) ? Current time: 04-20-2019, 09:28 PM Powered By MyBB, © 2002-2019 MyBB Group.